At Windmill Health Center, we know that headaches can hinder your normal lifestyle or at worst debilitate you. If you have a headache, you’re not alone. Nine out of ten Americans suffer from headaches. Some are occasional, some frequent, some are dull and throbbing, and some cause debilitating pain and nausea. The number of people who suffer from headaches every year is staggering, yet two-thirds of headache sufferers remain undiagnosed and in pain. Don’t suffer in silence. Let the Weston chiropractors at Windmill Health Center bring you relief from headache pain! The two most common types of headaches we see at Windmill Heath Center are tension and migraine headaches. 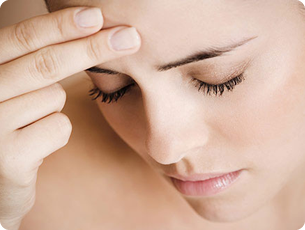 Migraine headaches generally occur 15 days or more a month, for at least three months. In addition, on eight or more days a month for at least three months, you might experience the following symptoms. If you spend a large amount of time in one position, such as in front of a computer, on a sewing machine, typing, or reading, take a break and stretch every 30 minutes to one hour. The stretches should take your head and neck through a comfortable range of motion. Do you find yourself frequently taking over-the-counter medications such as Excedrin, Advil, Nuprin, Aleve or Tylenol? “These types of drugs only serve to dull and hide the pain,” Dr. Browner says, “they don’t treat the cause, or source of pain, which is why the headache returns.” With these common over-the-counter medications treating only the “symptoms”, headache-sufferers feel compelled to take more and more pain-relievers, subjecting them to the many harmful side effects these medications can cause. Research shows that spinal manipulation – one of the primary forms of care provided by doctors of chiropractic – may be an effective treatment option for tension headaches and headaches that originate in the neck. Recommend massage therapy to reduce your stress, relieve sore muscles, improve circulation and immune system function. Offer advice on posture, ergonomics (work postures), therapeutic exercises and relaxation techniques. This advice should help to relieve the recurring joint irritation and tension in the muscles of the neck and upper back. When you are treated by our Weston chiropractors, you don’t have to worry about negative side effects…only positive results! We use state-of-the-art technology combined with a physical exam and potential x-rays, to find the source of your headaches. Then, we can recommend a course of treatment combining the finest in kinesiology, physiotherapy, and therapeutic exercises to reduce your pain and restore your health. I read this article and found it very interesting, thought it might be something for you. The article is called Headaches and is located at http://www.windmillhealthcenter.com/conditions-treated/headaches/.